Ending the Year in Ancient Greece! “We want to be Greek gods!” they exclaimed as the class discussed the final Journey Montessori School performance. The children had been studying ancient Greece and reading Greek myths for the past month, so it was no surprise that this was the most popular idea. And who doesn’t want to be a Greek god every now and again? “What is the problem you must face as gods?” their teacher asked, curious how this play would fit the diverse personalities in the classroom. She listened to their racing ideas of costumes and conflicts, banquets and battles over the next couple of days. Finally, the children decided that the setting would be Mount Olympus, the characters would be various gods from Greek mythology as well as a small boy, and their primary problem would be the waning interest of the human population. Clearly, the gods were not being worshiped properly anymore. They would resolve their conflict through a competition: the gods would each present a gift to the humans, and the small boy, called forth from the audience by Poseidon, would decide which gift would best serve humanity, much like the story of Athena and Poseidon competing for the noble city of Athens. The children wrote their own lines with guidance, painted their backdrop, and sewed their own costumes at home. On a cool evening early in June, the children, dressed as gods, presented to their parents the ideas of democracy, theater, poetry, medicine, various inventions and … chewing gum. 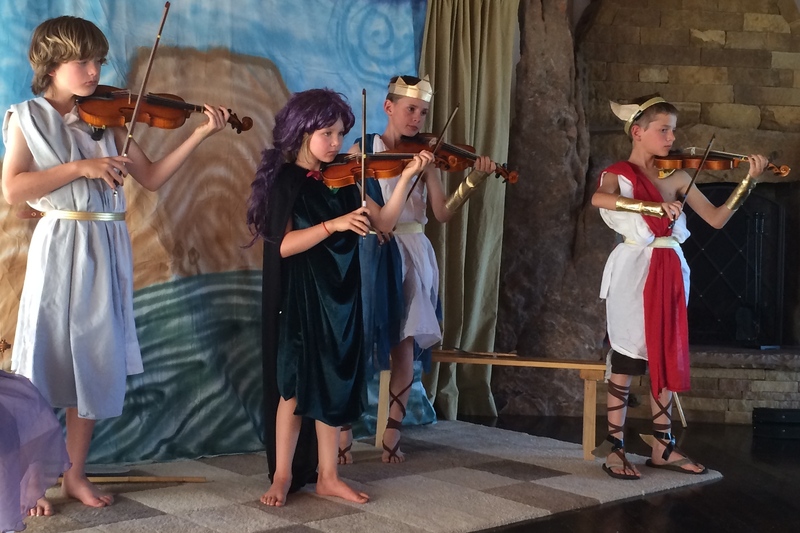 The play included not only research about ancient Greece, but also violin solos, a dance, and a bit of singing. It was an incredible finale to an incredible year!